This Friday is July 4th also known as Independence Day. 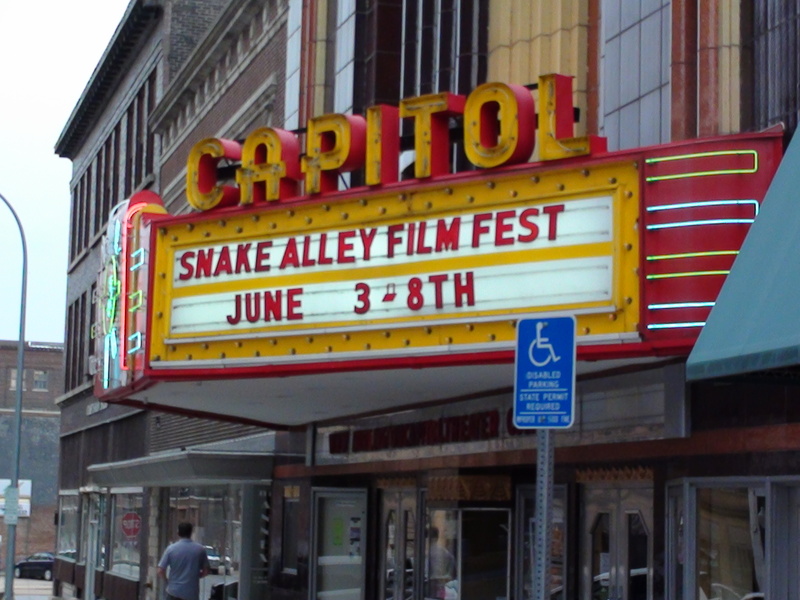 That marks one month since The Snake Alley Festival of Film convened in beautiful Burlington, Iowa. It’s hard to believe a month has passed. It seems like only yesterday. Of course, the other side of midnight is that it has taken me almost a month to recuperate. What with the rockin’ after parties, great films, fun readings of some fabulous screenplays, and being shanghaied at the last second to play a part in a play I hadn’t read (thanks JoJo and Kara)…it’s a wonder I’m not still in bed. Absolutely too much fun in one place! On top of that, my children forced me to mow “the back 40” and I have the whip scars on my arm to prove it. In fact, things were such a blur that I was man-handled (maybe I should say woman-handled) by six women and almost didn’t remember it! (God! I hope that’s not a symptom of old age.) the picture posted here proves it happened—and this was before the drinking started. Met some old friends, made some new ones, and had a great time in general including the very wet Wiener Dog races. If you missed it…well there’s always next year. And, believe me, next year will be even better! SNAFF 2014 AWARD WINNERS AND NOMINEES!!! Five Words. Harold’s Gift. Noah Hammer. The Violinist. Awaiting Dilation. We Are All Alone in this together. She’s Da Reason. Say My Heart Goodbye. Co-Pay. 4GLove. Molly. Motivating Stanley. Smile. Soccer Day. Something You Never Forget. Don’t Look There. Europa. Sad Monster. Talk To Strangers. The Adventures Of Kid McClain. Wonderland. Girl. The Heebie Jeebies. Playing With The Devil. Families Are Forever. I Never Said I Wasn’t Happy. Not Anymore, A Story Of Revolution. We Are Somebody. Green Acres. Feed. Animal Cookies. Closet. Money 1955. The Wheeler Parker Story. Love Letter. Catch Phrase. A Short Film. Our Urban Wilderness. There Is No God And We All Die Alone. Best Screenplay… The Nominees Are…. Buffalo Gap. First Come First Serve. A Man Of His Word. What Matters Most. Awaiting Dilation. Catch Phrase. Co-Pay. Caught In Condiments. She’s Da Reason. Das Kind. Pauline In A Beautiful World. Closet. Soccer day, Smile, Das Kind, Pauline in A Beautiful World. A Not So Good Pilot. We are watching the last block of films for the night. This will be followed by a Catered Red Carpet Party. The Red Carpet Party is usually held in the street in front of The Capitol Theater, but due to a lot of rain, it had to be moved indoors. Oh, well! The lobby of the theater and the theater annex will be a bit cramped, but the film makers and film goers will get to know each other better. It’ll be warm and cozy. Prior to this section of The Snake Alley Festival of Film, was Cyn-A-Palooza. The Wiener Dog races were run in a monsoon, but the short-legged contenders put on their snorkels and were up for the challenge. There was a lot of barking, yapping, and smack-talking…but run they did. No Wiener dogs were hurt during these races. Once we get finished with the awards ceremony, everyone will head to Martini’s for the final “after party” this year. Then, it’s home to “dry out” and plan a new film project for next year. 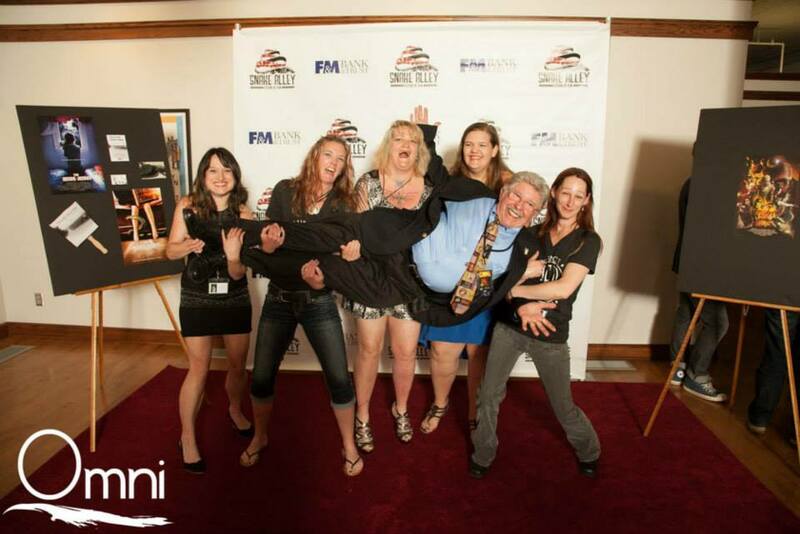 If you missed The Snake Alley Festival of Film this year, you missed a fun, and rocking event. Plan to be there next year. I’m already hearing rumblings of bigger and better doings for next year. Well, we’re into day 4 of The Snake Alley Festival of Film. So far it has been a fun and amazing event. Everyone here is friendly and there are some amazingly talented people concentrated in a small area. One of the new features this year was to have actors read scripts submitted by screenwriters. JoJo Munkee did an amazing job of collecting actors and rehearsing them. This feature gives screenwriters get to see their words come to life. It helps them to visualize how their words play as an interaction between characters. I missed my cues a couple of times and missed leaving the stage during one part. It was all in good fun and in the name of art, so no harm, no foul. If you’ve never been to an indie film festival, I urge you to go. If you want to attend a great indie film festival, come to The Snake Alley Festival of Film in Burlington, Iowa. Tonight’s after party is at The Drake and promises to be a real blast. And Saturday is Cyn-A-Palooza, complete with a street carnival, big sales, and topped off with Weiner Dog Races. Then, on Saturday night, we have a street party in front of the Capitol Theater, the awards ceremony, and another after party at Martini’s. Follow Snake Alley Festival of Film on Facebook and see all of the pictures.